Last weekend we attended our first NHL game as a family! When we planned to take her to a Canes game for the first time, I got a little anxious about it. What if, what if, what if?! We all handled it really well, though. Here are a few things that might help my fellow first-timers. Leave most of your emergency baby stuff at home when you’re going to the game. Yeah, I know it’s there to help put you at ease. But you really won’t have room for a big diaper bag. Edit it down to the bare essentials. You’ll be so glad you did. Pack as little as possible. It currently costs $20 to park your car at the arena during a Carolina Hurricanes game. (I’m told that’s less expensive than other arenas. But that seems exorbitant to me.) Be prepared to pay for parking when you arrive. Traffic moves relatively quickly when you’re arriving. Most lanes are in-bound, so follow the people directing traffic and other cars to keep things moving. Plan on a longer wait when you’re leaving the game if you stay until the end. It took us a long time to get out of the parking lot. With a little kid crying in the backseat, every minute you’re waiting in traffic can feel like an eternity. 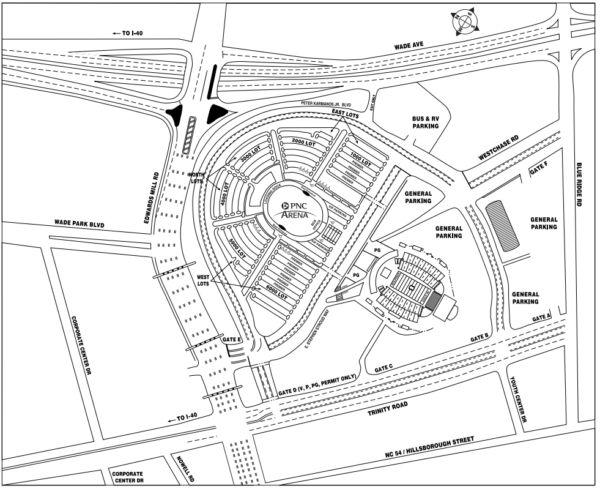 Visit the PNC Arena parking guide for more info. Get more info about parking at the PNC Arena before you leave home. You probably already have a few kid-friendly apps on your phone. If you don’t download them before you leave home. (Home is where the wifi connects automatically, right?) Fully charge your device while you’re at it, too. Our daughter seemed on edge a little bit during the first part of the game. I think she was hungry and anxious because of the noise. We turned on one of the baby-friendly games (a balloon popping app) on mute, and she seemed to calm down a lot. Some kids have short attention spans and sitting still for a whole period can be challenging. I was so glad we had that app to keep her happy. 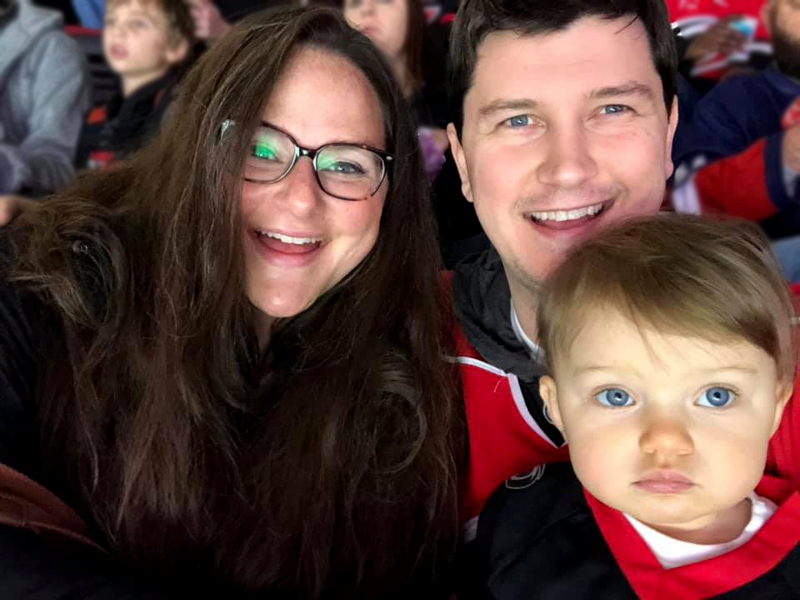 We attended our first Carolina Hurricanes game as a family in 2019! We picked a Sunday noon game, with the thought it might be best for nap time. Our girl woke up right before the game so we missed puck drop. That also meant she was also hungry when we arrived. But she felt a little better with a full tummy, and warmed up to the whole experience by the time we left. When you’re attending with the littles, don’t feel pressure to get there early or stay for the whole thing. Walking around the concourse during intermissions will help keep the kids entertained and burn off some energy. Our friends having been doing this for years and it’s a brilliant move. Our daughter loved it. There are so many things to explore, people to see, and smells to enjoy. We’re obviously new parents attending our first Carolina Hurricanes game as a family. If you’ve got suggestions or tips, use the comments to share! I would love to hear from you. We sit in the lower bowl, and as our toddler has grown it’s become impossible to have her on our laps in those seats any longer. We’ve found that hanging out in the bar lounge looking down on the game from behind the net works well, as it gives her more room to be wiggly. The challenge is getting seats. If this is a repeated event, have a routine. In our case, 2nd intermission = strawberry ice cream. She actually started chanting it during 2nd period… she knew what was up. Know where the family restrooms are, a primary and a secondary. Even if you hate the idea of mascots and/or cheerleaders, our are VERY kid focused. Let your kid get excited by them. Be ready to go for a walk around the concourse. I suggest trading off. Be ready to leave early. If your kid is miserable, you will be as well. And most importantly- ear protection. Greaaaaaat suggestions, Doug!!! Thank you so much for sharing. I know our toddler will start to get more and more wiggly! She hated wearing ear protection. How’d you get yours to keep them on?